Hello! I have a Html Page as a preinstruction in my script. There is nothing in my Html page that indicates a box with the content "press space bar to continue". However, this box appears when I run the test, as you can see below. The problem is that I need a test in portuguese language. Is there any way that I can translate it or make it dessapear? Is it something that Inquisit does automatically or am I doing it wrong? 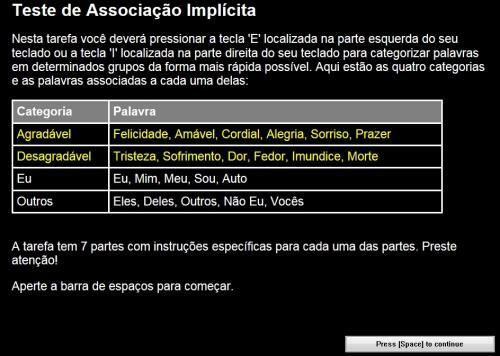 <p>A tarefa tem 7 partes com instruções específicas para cada uma das partes. Preste atenção! The next button is not generated by your HTML. It's there because you are presenting the HTML file as an instruction page (<htmlpage> element). The button labels on instruction pages are controlled per the <instruct> element's /finishlabel, /nextlabel and /prevlabel attributes. That's where you put your translation for the text on the respective navigation button. / finishlabel = "Your Portuguese text goes here." / nextlabel = "Your Portuguese text goes here." / prevlabel = "Your Portuguese text goes here."